The Best of Peter Green's Fleetwood Mac. Superb guitar playing. Some great songs. Getting ready to go to Oriental, to hear,”Backtrack,” an acapella group, at The Old Theater. Judicael Perroy's cd, "Manuel Ponce Guitar Music 4"
Asturias by Isaac Albéniz...the piano version. I've heard the classical guitar version in concert one month ago, and now I've heard the piano version in concert played by Anna Scheps (two hours ago). David Tanenbaum's 'Lute Masterworks' CD- Milano, Dowland, Bach. 'Bach: The Sonatas and Partitas' by Paul Galbraith on my new tube stereo amplifier. It sounds great. Michel Camilo and Tomatito -- a combination of jazz and flamenco or piano and guitar. 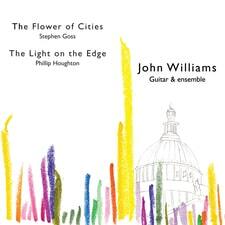 John Williams' new recording. Let's just say that the artistic quality of the cover matches that of the music. "Inspirations," a cd by Will Martin. He performed last night at The Old Theater in Oriental. He's from New Zealand, and is a wonderful singer and musician.